I’ll be honest, my initial thought was: UGH, a class. I think it’s a combination of me being a control freak wanting to dictate my own workout AND the fact that I’ve never been much of a ‘pay for each workout’ kind of person. I’ve just never really been into the whole fitness class thing. Nominating Rachel (my roomie) to take the class with me was a no-brainer because we basically do everything together. And – she loves classes so I knew she’d talk me into it. 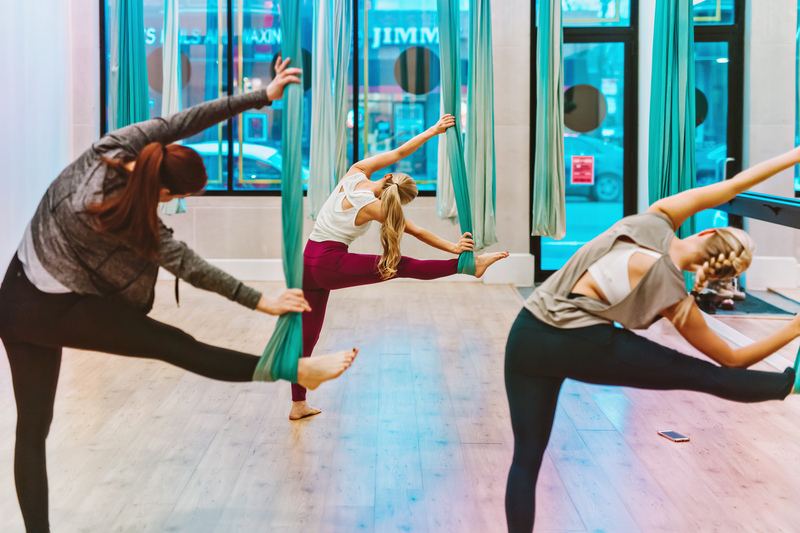 The challenge started with a box of Athleta goodies to wear to the event including their new #UpForAnything tights – versatile, high-waisted (A MUST for me), available in regular, petite, tall, and plus, and in a variety of vibrant colors. They’re comfortable, supportive, and have so many pockets! 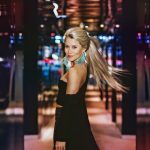 We tried on the outfits, stretched out a little bit, and did some research on what class we thought would be fitting for this challenge. We ended up sleeping in too late and missing the Missy Elliott dance class we had originally signed up for and both agreed our next idea of kick-boxing would be fun but not really our style. 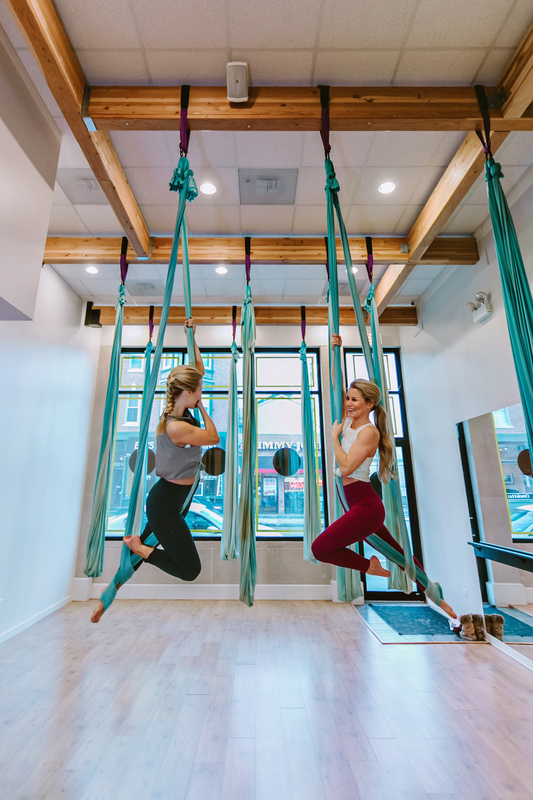 So, we finally came up with the perfect idea: Aerial Yoga at Air Aerial Fitness in Chicago! 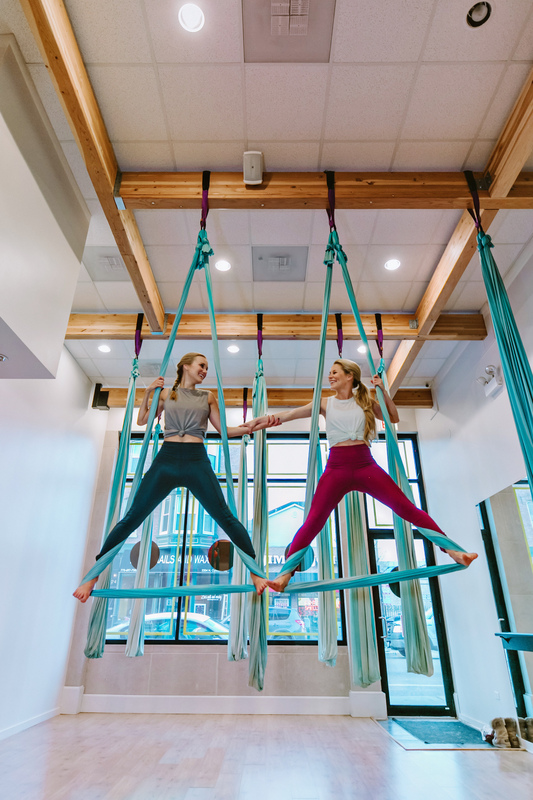 We started our Friday morning at Air Aerial Fitness Chicago at 6:50 AM. 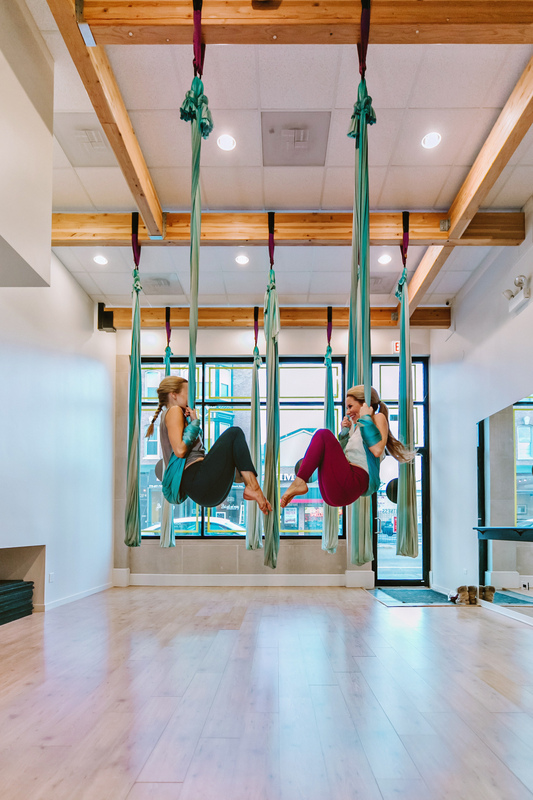 The room was filled with turquoise aerial hammocks that honestly looked pretty intimidating to us beginners. Cara, who hosted our class, did such a good job of stretching us out and explaining things so we were comfortable getting started. 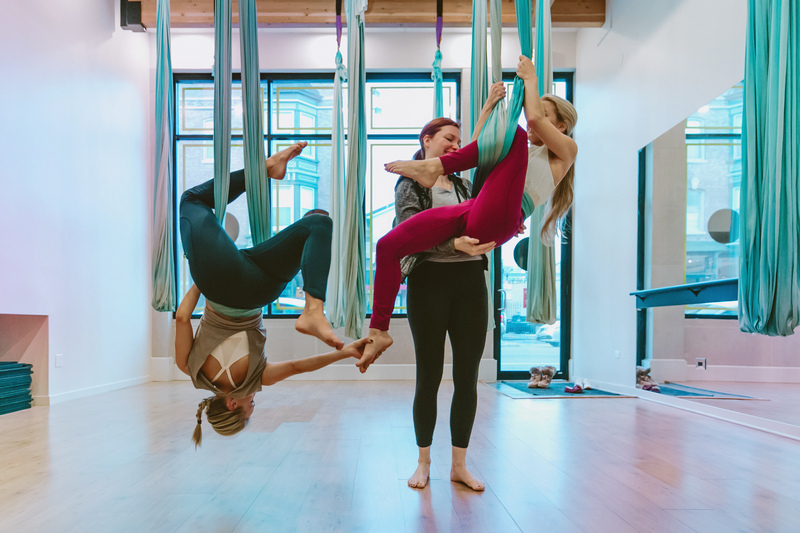 Once we stretched out and did a few beginner poses, Rach and I seemed to be catching on pretty quickly, so we told Cara to help us try some “really cool poses”, haha. We had so much fun learning ‘the ropes’ and challenging ourselves to try more advanced poses. I loved the whole experience and honestly think it made me more open to the idea of trying new classes. Sometimes they’re great for just meeting new people, getting out of your comfort zone, and trying something new. 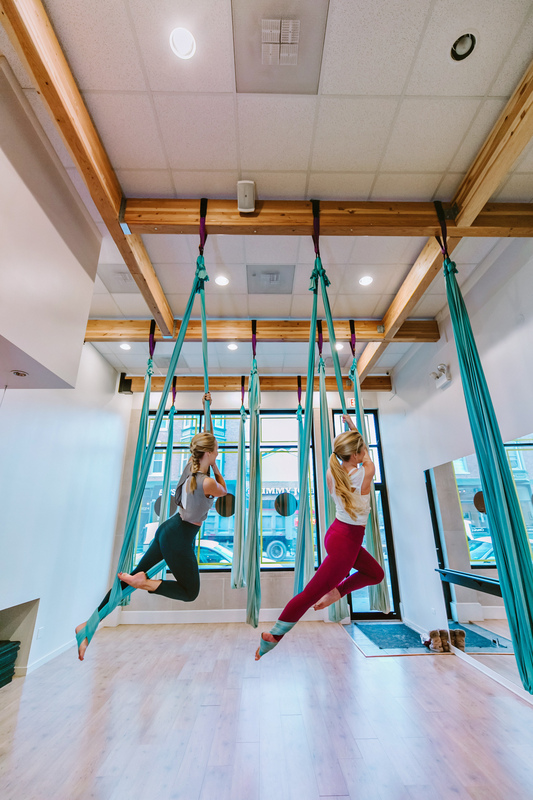 Plus, aerial yoga is one of the THE BEST core workouts. To all my gymnasts and cheerleaders, this is right up your alley. 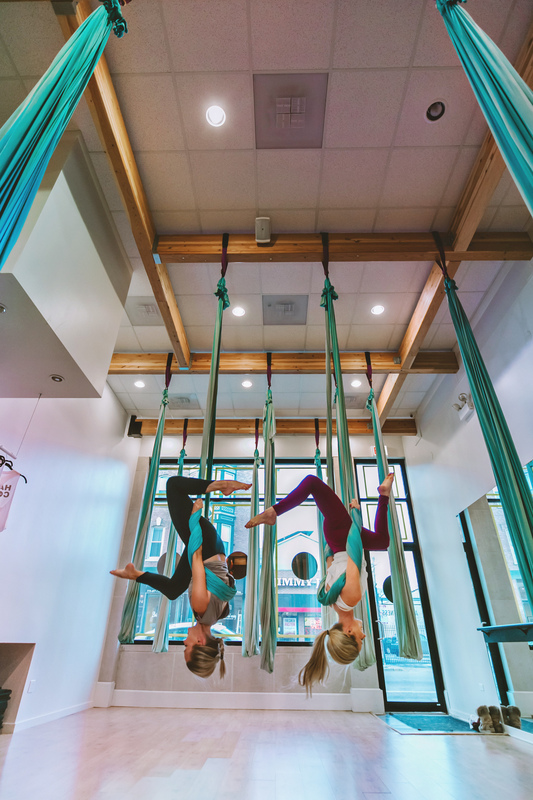 Chicago girls, Air Aerial Fitness would be the best idea for a bachelorette party or upcoming birthday party! #UPFORANYTHING is in general just such a great message. We all need to be a little more up for anything. Whether it’s in our fitness goals, career goals, or just life goals in general. Don’t EVER underestimate yourself. You never know what you’re capable of until you try. And if you try and end up failing – there’s still so much you can learn and build on from failure. So really, it’s a win-win. 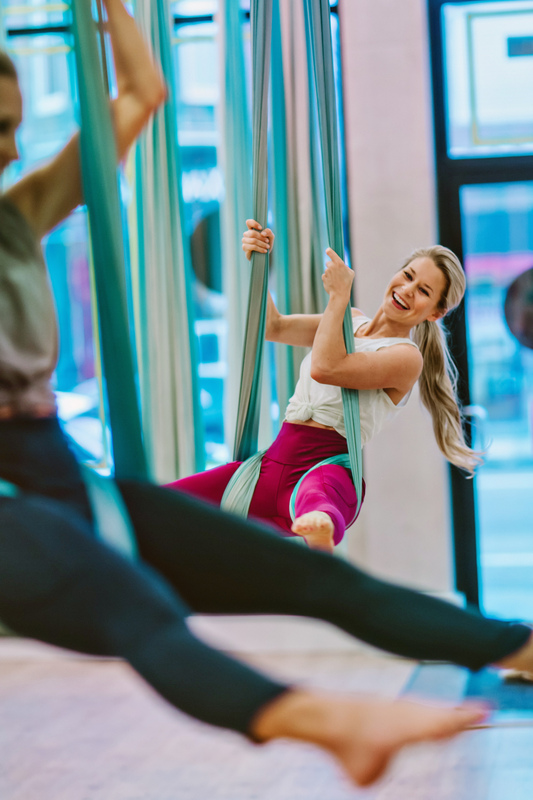 I’m nominating YOU to take on this challenge to take a class or try an activity that’s outside your comfort zone this month. I’d love to know what you decide and how it impacts your mindset about achieving your goals. This looks like such a blast!! I love your outfits, too! Adorable.